NEW YORK (AP) — With the fate of President Donald Trump’s Supreme Court nominee suddenly uncertain, emboldened Democrats clashed with cautious Republicans as both parties grappled with an increasingly messy nomination fight weeks before the pivotal midterm elections. The GOP risked further alienating female voters — particularly in the nation’s suburbs — by embracing Trump’s hand-picked Supreme Court nominee, Brett Kavanaugh, after an allegation surfaced over the weekend of decades-old sexual misconduct. Democrats, who seized on the development as justification to delay the high-stakes nomination, could energize complacent Republican voters if they’re viewed as playing politics with the sensitive allegation. Amid the chaos, a key question quietly emerged among some political operatives: Would Republicans force through the Kavanaugh nomination even if it jeopardizes their control of Congress? For some, the short-term political pain might be an acceptable tradeoff for a generation of conservative control on the nation’s high court. Ford’s attorney said Monday her client was willing to testify publicly about the allegations on Capitol Hill, where a key Kavanaugh confirmation vote was scheduled this week. Kavanaugh, now 53, called the allegation “completely false” in a statement, adding that he “had no idea who was making this accusation until she identified herself” to the Post. The developing situation threatens to exacerbate the GOP’s rocky Trump-era relationship with suburban women, who are poised to play an outsized role in the districts that will largely decide the House majority this fall. Election Day isn’t until Nov. 6, but early voting begins Friday in Minnesota and in roughly three weeks across several more states. Vulnerable Republican House incumbents have largely avoided the issue, which flared Monday in northern Virginia’s suburbs, where GOP Rep. Barbara Comstock is fighting for her political survival. The situation could draw parallels with Justice Clarence Thomas’ 1991 confirmation hearings when he faced allegations of sexual harassment from Anita Hill. The Senate ultimately confirmed Thomas, though public acceptance of sexual misconduct has shifted dramatically over the last three decades. In Nevada, where Republican Sen. Dean Heller is in a difficult fight for re-election, his Democratic challenger, Rep. Jacky Rosen, used the allegation against Kavanaugh to stoke doubt about Heller’s judgment. Heller said last week he had “no reservations” about voting to confirm Kavanaugh. Rosen was quick to suggest in July that Kavanaugh would pose a threat to abortion rights were he to be confirmed. “If Sen. Heller still has no reservations about confirming Judge Kavanaugh to a lifetime appointment on the nation’s highest court, then he isn’t listening to Nevadans,” Rosen said in a statement Monday. “If U.S senators are not going to give a careful and thorough consideration of Supreme Court nominees, then I don’t know what they think their job is,” Bredesen said on Twitter. 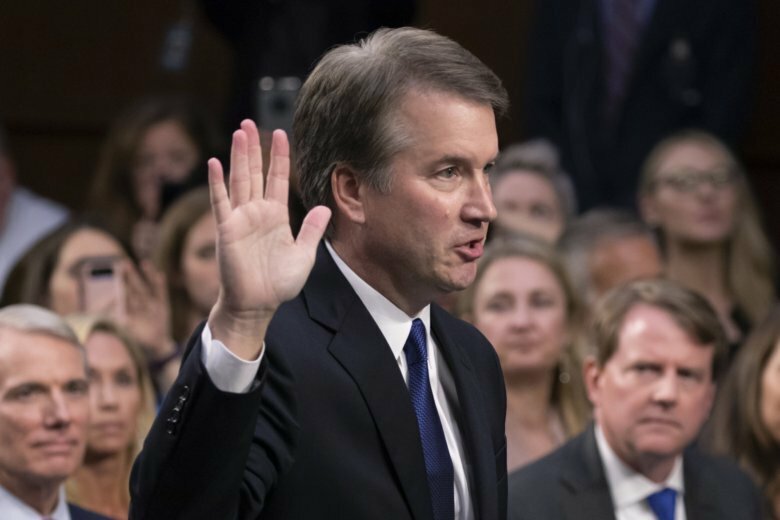 Democrats — and some Republicans — have called for a delay in the nomination process until Ford’s allegation could be investigated further. The development offered some respite to several vulnerable Democrats who are facing re-election in Republican-leaning states and who had avoided taking a firm position on Kavanaugh’s nomination. “Given the nature of these allegations, and the number of outstanding questions, I believe the Judiciary Committee should hold off on Thursday’s scheduled vote,” he said in a written statement. “Professor Christine Blasey Ford deserves to be heard and Judge Kavanaugh deserves a chance to clear his name,” Manchin said. Beaumont reported from Des Moines, Iowa. Associated Press writers Brian Slodysko in Indianapolis, Juana Summers in Washington, Nicholas Riccardi in Denver and Bill Barrow in Atlanta contributed to this report. This version corrects that Tennessee Senate candidate Marsha Blackburn is currently a House representative, not an incumbent senator.